Sculpture from found objects, 17.6 x 10.75 x 9.75 in. Ink and graphite on high-impact polystyrene, 25.7 x 17.3 in. León Ferrari: To Write at Sicardi Gallery, through Dec. 19, offers up two modes of the late Argentinian’s artwork. The larger section of the exhibition focuses on Ferrari’s interest in writing—but not as a tool of literary communication. Instead, the artist’s drawings and paintings depict widely expressive text-like shapes, varying in form from jagged and impulsive to embellished and refined. The other portion of the show is composed of Ferrari’s collages and assemblages, which propose biting political and religious critiques. The resulting exhibition To Write explores “inner” psychological processes as well as “outer,” public declarations in a moving double portrait of Ferrari’s practice. Hailed as one of Argentina’s pioneering conceptual artists, León Ferrari’s artistic career began in the 1940s through his self-taught study of drawing and painting. 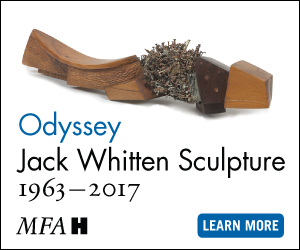 In the 1950s he explored sculpture; it was not until the 1960s that Ferrari began to base a portion of his practice in the expressive abstraction of script. Using obscured words and sentences, Ferrari captured human states and experiences—confusion, rage, meditation, performance, or memory—in scrawled studies. In an untitled 1962 piece, Ferrari draws a meandering line of graphite on a small panel of wood. He creates depth in the work by applying his pencil in varying degree of pressure, and faintest lines seem to hover in the background like a hazy fog. As the line darkens, it moves forward in space—floating to the surface—traversing the middle ground and eventually emerging into the foreground where it becomes strong and solid. The wooden panel can be perceived as an intimate object; about the size of letter paper, it appears portable and personal. Its depicted line also seems to represent something private: perhaps a process of prolonged contemplation, with the artist’s final conclusions appearing as the darkest and closest formations. León Ferrari, Untitled, 1986. Collage, 9 x 9 3/16 in. 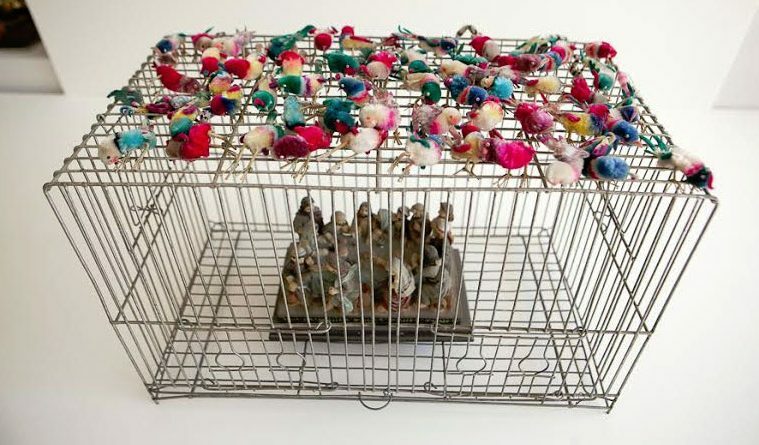 Image courtesy of Sicardi Gallery. While this 1962 work is representative of bare and poetic introspection, Ferrari used his repetitive text motif to depict a variety of emotional experiences. A 1991 untitled work from the Errores series is filled with the layered peaks and troughs of the oscillating sine wave. En masse, this repeated shape lends the work a harmonious and buzzing energy. 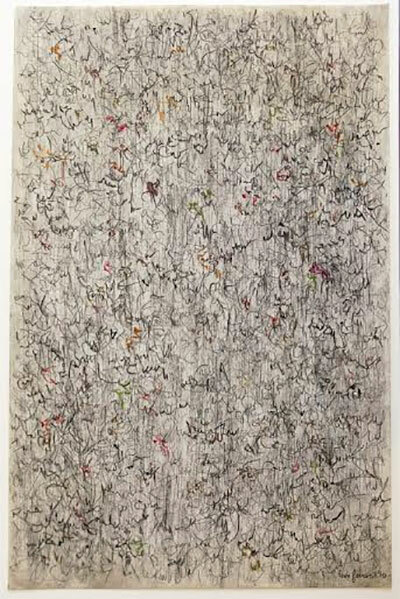 In a 1990 work, Ferrari draws his lines with a different, signature-like style, giving swooping embellishments to the beginnings and ends of his pseudo-words. These forms are also layered, this time with the density of thick foliage. Ferrari also incorporates touches of soft pastel color into the work, evoking a weathered, historical text. Sometimes, works’ lines are much straighter, running from the left to the right of the page as if following the outline of a group of mountains. In others still, lines broaden and pool in inky black forms or drips. Two sculptures from the mid-2000s transform Ferrari’s exploration of line into three dimensions. Hung from the ceiling, both are made from stainless steel wire—twisted upon itself into organic webs. The sculptures are ethereal, skeletal variations of Ferrari’s thematic line, and represent the artist’s unending exploration of this simple and malleable form over many decades. Although not obviously indicated by his text-based works, another aspect of Ferrari’s legacy is related to his political outspokenness. The mid-twentieth century yielded tumultuous and often violent events in Ferrari’s homeland of Argentina. The artist experienced the 1976 coup d’état and militarization of the state, resulting in the flight of his family to Brazil and even the disappearance of his son. With this knowledge, viewers can read the frustration of these experiences into many of Ferrari’s line works. Yet, another genre of the artist’s practice expresses his views more blatantly. 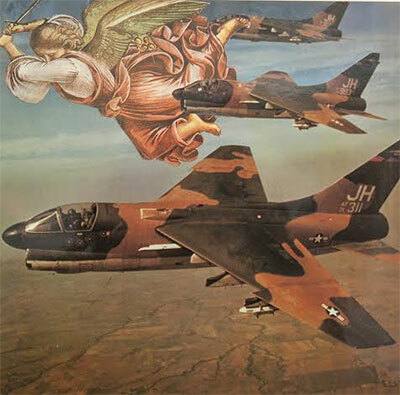 Combining historical, religious iconography with images of war, Ferrari’s vibrant collages and assemblages from the 1980s and beyond bluntly express his criticism of Catholic Church and its support of the Argentine dictatorship. The collage works depict scenes of golden Renaissance angels flying alongside fighter planes or missiles launched behind the Last Supper. Ferrari’s sculptural assemblages are also particularly visceral. In Infierno, a round grater is attached to the back of a Virgin Mary sculpture. The metal grater is mostly hidden by the figure, and thus covertly threatens to draw blood from anyone attempting to pick up the icon. Although these works by Ferrari don’t have much to do with the act of the writing, they do reference the historical text of the Bible—while acridly criticizing the duplicity of the modern power structure built up around it. 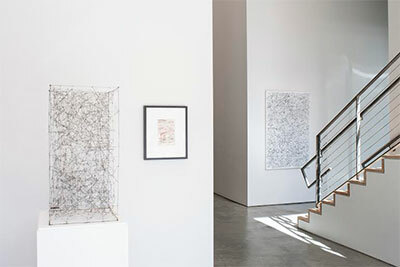 León Ferrari: To Write, installation view at Sicardi Gallery. Photograph by Paul Hester, courtesy of Sicardi Gallery. While the transition between León Ferrari’s line drawings and collages in To Write is abrupt, the juxtaposition of these two expressive modes is not without meaning. Both genres of Ferrari’s work pursue revelation: one through the depiction of mental processes and the other by stating the link between religion and violence in modern Argentina. Like two sides of the same coin, one form pursues discovery, while the other boldly announces reality—a combination of vulnerability and conviction that is both visually beautiful and intellectually admirable.